If it weren't for Martha Stewart, and a friend's absolute belief that we could master the flooded-icing technique Martha uses to decorate cookies, none of this would have happened. The year was 2002. My friend Candy and I decided to give this cookie decorating thing a try. She is an artist, and an experienced baker. I am a notorious bake-o-phobe; to me, the word "cookies" generally means the Toll House chocolate chip cookies that are Ted's specialty. Our husbands helped by mixing the icing colors. Darlings that they are, they just didn't seem to understand that fuschia, aubergine, yellow and something turquoise-ish weren't the ideal colors over the dark brown of the gingerbread. I rallied a couple of friends to redecorate; they were fantastic and enthusiastic, mixing bright new icing and helping us overpaint those cookies. 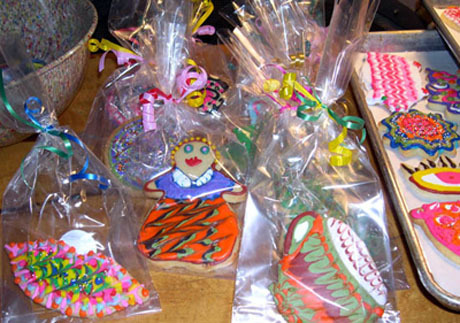 We wrapped each cookie in a cellophane bag, tied with beautiful ribbons. I called an agency that provides emergency shelter for Latino families, and asked the director if they'd like our cookies. When we delivered the cookies, we saw the smiles on the faces of the shelter staff, and heard the gasps ("We had no idea your cookies would look like this!" -- meant in a good way, not the "oh, yuck" way). I imagined how the children's faces would light up when they saw our cookie creations. I knew just what to do. Sort of. By the time the next December rolled around, I had a name -- Drop In & Decorate Cookies for Donation -- and a plan: Come up with a simple cookie recipe. Practice my icing technique, so I could teach it to others (though, in truth, I was counting on my baker friends to teach me). Bake cookies ahead of time. Invite friends and family to drop in on a weekend and decorate. Connect with a local agency that serves adults and children, and that would like the gift of cookies. Find some wrapping supplies. Turns out, it was easy. I contacted the Rhode Island Coalition Against Domestic Violence, which represents six emergency shelters for women and children, and they were thrilled. We decorated enough cookies for them and for our town's food pantry, too. People had so much fun that they asked to be invited to my next Drop In & Decorate party (Next party? Oh yes, said I, realizing I was on to something, of course I will do this again. 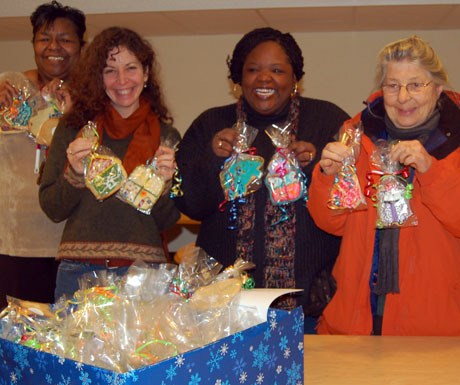 ), and now, in our sixth year, more than sixty decorators ranging in age from 10 to 70+ will be providing cookies to seven family shelters and two food pantries -- more than 400 families served each year, more than 750 cookies decorated. It's a wonderful way to bring people together to "give back", without spending a lot of money. It can be you, or you and your significant other, making a dozen cookies and delivering them to your community food bank. Everything you need to know, including how/where to donate your cookies, how to organize a decorating party, where to find supplies, and cookie and icing recipes, is available in our free HOW TO HOST YOUR OWN PARTY guide. 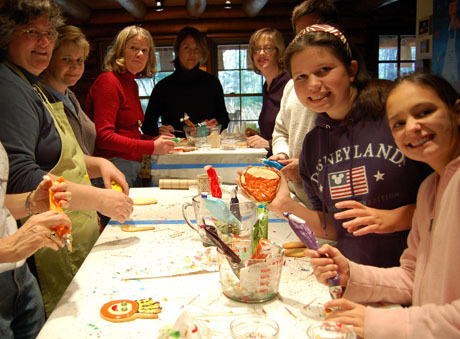 Last year, a group of parents and children as young as three years old, using pastry bags and the flooded-icing technique, decorated cookies for Providence Ronald McDonald House. My friend Mary had a small Drop In party with her family. In December, the Sargent Rehabilitation Center will host its second Drop In & Decorate event, where adult clients and staff decorate cookies for children. 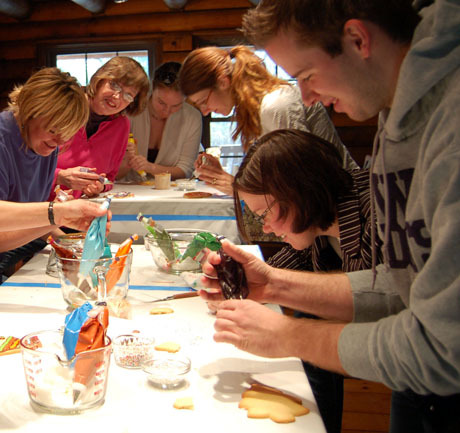 Parents and kids at the Meadowbrook Waldorf School will decorate cookies at their school fair and donate them to a local agency. And one of Ted's employees and her friends are organizing their first Drop In party this year. 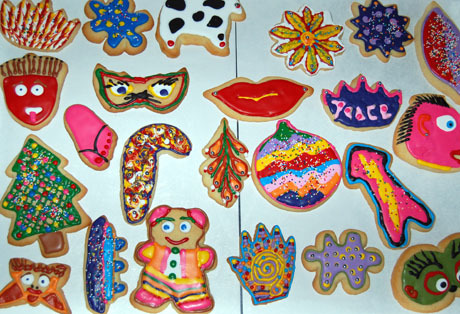 To learn more about Drop In & Decorate Cookies for Donation, and see lots of wonderful photos, visit www.dropinanddecorate.org. Lucia, a dedicated volunteer who makes our palette of icing colors every year, says: "Drop In & Decorate captures what I value about the holiday season: fun, togetherness, not consumer oriented, not about spending lots of money, giving to others, creating something unique and homemade." Preheat oven to 375°F. Line a couple of baking sheets with a Silpat or parchment paper. In a large bowl, stir together flour, baking powder and salt. In another large bowl or the bowl of a heavy-duty stand mixer, beat together the butter and sugar, until fluffy. Add egg, milk and vanilla, and continue to beat until well blended and smooth. Beat flour mixture into the butter mixture until smooth. Divide dough in half. Place one half on a sheet of parchment paper or wax paper; cover with another sheet and roll to 1/4 inch. Repeat with second half of dough. Refrigerate dough for at least 30 minutes, or up to a couple of days (or, if making far in advance, you can freeze at this point. Wrap sheets tightly in plastic wrap). Remove one sheet from the refrigerator; peel off the top wax paper, then replace paper and invert dough. Peel off and discard what is now the top sheet of paper, and cut out the cookies. (cookies will spread, so do not place too close together on the baking sheet). Reroll scraps, refrigerating if necessary to firm the dough. *Note: to make multiple batches, do NOT double the recipe. It’s hard to control proportions. Instead, make multiples of the original recipe, one batch at a time, for guaranteed success! *Another note: Rolled sheets of cookie dough can be made ahead and frozen (or, if you're going to use them within a day or two, you can stack the rolled sheets of dough on a cookie sheet in the refrigerator). Let defrost until dough is pliable enough to be cut without breaking cookies, but not necessarily completely defrosted. Look at those smiles! What a great idea, Lydia! It's so nice to see an idea start in the kitchen with a few ingredients that then reaches out to touch the entire community! Thanks for the photo of the contents of the King Arthur kit. I'll be sending one to my co-workers at Sargent Rehab. Center. We're all looking forward to decorating! Just ordered a kit for my step mother who is already having a cookie decorating day for family and friends. This will add a whole new dimension! Thanks Lydia! Hi Lydia, this is a great way to create awareness. I will keep this idea in mind next time I am try to raise funds for charity. I usually just bake cakes and cookies & sell them, pretty much a solo activity - yours is a much better idea because it gets more people involved. Those cookies are so gorgeous! I sit in awe! I've decorated lots of cookies in my life but now see I am a rank amateur. Nonetheless - I can blog with the best of them - and I'll blog tomorrow! Wow, I am awestruck by your creativity and dedication. What a lovely idea! Keep up the great work! TW, thank you for your kind words, and for writing so eloquently about Drop In & Decorate on your wonderful blog. Kathy, thanks to you, too, for sharing the fun of Drop In & Decorate on your fantastic blog. Lucia, my dear, you are the embodiment of all that is good about Drop In & Decorate! Laura, that is so cool!!! Kelly-Jane, it really is fun. If only you lived closer to Rhode Island, you would be so welcome to join us. Nora, getting people involved is the real fun of this project -- and for me, because I'm not much of a baker, it's a necessity! My friends have taught me everything I know about cookie baking and decorating, and I hope I've shown them how much fun it can be to give back. Katie, in advance I thank you so much for helping to spread the word. I think our cookies are pretty terrific! Kamini, welcome to The Perfect Pantry, and thank you for sharing the spirit of Drop In & Decorate. The cookies look so amazing, I´m not sure I could eat them. Beautiful. And a great idea, too. What a lovely session! And looks at those cookies...they are so attractive and colorful. Chris, many thanks -- Drop In & Decorate is, as you've so beautifully written, a "pay it forward" idea. Lobster, sometimes, I feel that there is a cookie too beautiful to eat -- so I take its picture, and then imagine the smile on someone's face when they see the cookie and take a bite out of it! I always have the picture, and someone else has the fun of the cookie. Tigerfish, it was so hard to choose just one photo of cookies to share in this post -- so I'll be writing and sharing more over the next two months. Hi Lydia ~ Your idea captivates, truly. Isn't it funny how something accidental turns into something spectacular, given inspiration, drive, purpose?! Not to was on too much or become morbid about this, but it's easy to imagine that some years MANY down the road that your NYTimes obituary will read, Founder of Drop In & Decorate. It's easy to imagine this spreading all over ... lovely, just lovely. Okay, my one question is if there's an online source for the bags? Or do you just use big sheets of Saran? (Oops, that might be in your How to Hold document which I haven't read yet. Feel free to refer me there!) It also occurred to me that for a kids event (which I'm working on) you could attach a 'gift card' to the ribbon, then have the kids write short notes, "Hi my name is Sarah and I'm 10 years old. I hope you like the cookie I've made for you. XOXOXO". It also occurs to me that a kids event might involve delivering cookies to elderly folks in the neighborhood, also to local fire fighters and police, to say 'thank you'. Also, an idea for next year, maybe there's a diabetic version? I know, I know, it's a cookie. But I'm thinking about nursing homes, especially. Can you tell I'm captivated? Lydia, dear one, you're onto something here, something with legs ... and smiles! Alanna, dear friend, your ideas have my mind going a mile a minute! First, to answer your question, to buy bags in quantity go to http://www.bagsplus.com. I use item #PG410, a good quality food-safe cellophane bag that's a great size for any large cookie, with plenty of "top" for ribbons. The attached card by kids is a brilliant idea that I will share in my "How to Host Your Own" guide later today! And sugar-free sugar cookies? They're very much on my list, as we have Type-1 diabetics in our family. Thanks so much! What a great idea! Thank you for sharing this. Love the idea. Great post. This is absolutely wonderful!! I'm always looking for projects like this since I am a Girl Scout leader. Thanks so much for this post!! Hey , u've got a fantastic thing going on here. So many cookies for so many families !!!! U must've been blessed by so many people for this wonderful thing u've started. The cookies look gr8 BTW . keep it up !!! Cindy, I agree, it is a bit tough to find in the King Arthur Catalog. Glad you found this post, though. Helene, welcome to The Perfect Pantry -- and thank you. Sabina, when I saw your name I thought that maybe my six-year-old granddaughter (same name) had learned how to send blog comments! Please let me know if your scout troop does this, and send a photo. Kate, we are very proud of our cookies -- and we're all amateurs, so doubly proud! Thanks for your kind words. Such a great cause Lydia! I'm thrilled to be a part of it. My blog post has now been posted :) Keep up the great work! Hey Lydia! This is a great post--you can see how much fun everyone is having! I'm writing my Drop In and Decorate post right now and am looking forward to posting it soon! WOW! This is some set of cookies! My good friend has a cookie decorating party and she buys a cheap set of paint brushes every year and we actually paint them which also works. I'm so excited about this idea. I'm scheduling a decorating party for December 8. Hillary, thank you so much for helping to spread the word, and for the lovely post on your blog. Susan, we are all about the fun!!! Thank you for being part of the fun of Drop In & Decorate. Caroline, that sounds like a great way to decorate. We've tried the icing crayons, too, but have settled on the royal icing as the best way to do our "painting". Your decorating party sounds like fun! Becki, welcome to The Perfect Pantry, and thanks for being part of Drop In & Decorate. Please email to me and let me know more about your plans -- I'll be writing small bits about people who are hosting, and the agencies they're donating to, and I'd love to include your party. You people are amazing! My true idols! Wow, what a great idea - I love that you are giving back while enjoying yourselves. I really want to do this in Italy - I just bought some cookie cutters! What a fabulous idea! And I loved reading that post. The cookies are amazing! Patricia, thank you, my friend. Sara, please let me know if you do host a Drop In event. Wish I could be there. This is such a great idea, I really hope to find a way to do this. One request: please share this flooded icing technique (or a link). Those cookies are wonderful as is the whole idea of decorating and donating the cookies. Renata, welcome to The Perfect Pantry. Please let me know if you do have a cookie decorating event. I'll be adding a "how to do the icing" video on my web site (www.ninecooks.com) in a few weeks. The technique is easy, once you understand how Royal Icing works. Pipe a border around the surface you want to flood, and let it set for a few seconds; then, add a drop of water to the icing to thin it, and fill the space inside the piped border. Use a toothpick to help push the icing into the corners, if needed. I told my neighors about it and we are getting our brains, their kids and the husbands together on saturday afternoon to make cookies and drop them off. Great initiative! Tartelette, that's exciting. If you can share a photo, I'd love to see what a real pastry chef does with her cookie decorating -- and of course it will be such fun for all of you to do this together. Hooray for you! Okay, I'm in. If I can round up some friends & shake out the flour bins this could be a great event... I'd also like to blog about it. Could I put your .jpg on my site, to click to yours? Lesa, that would be great! Yes, you can use the graphic, and if you would, please send me a link to your post (email to lydia AT ninecooks DOT com). I'll be happy to add your link to my posts about Drop In & Decorate. I just posted about Drop In and Decorate on my blog, The Family Quilt, where I discuss ways that families can serve others together. This project is a great way to do that! 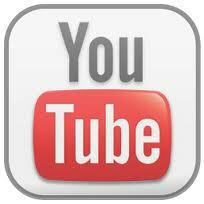 Shauna, thanks so much -- I've added your link in my posts. You should be so proud of this concept and the good cheer you are spreading. I'm was going to host a cookie exchange in a few weeks, but I've changed my mind and am going to do this instead. What a fantastic idea. Kristen, your comment makes me so happy! Thank you for helping to spread the word. Please be sure to email the details to me (who's getting your cookies, etc. ), and I'll share the news in one of my posts! That is so wonderful! We're in the middle of a never-ending move (which will hopefully end in mid-December, I do exaggerate), but I'm going to bookmark this and maybe try to do something this year for Valentine's Day. When I was in Texas, I baked cookies for the local Children's Advocacy Center and also organized some dinners for the Ronald McDonald house with my volunteer organization...but I like the idea of the communal icing party! I will definitely do this at some point in the future. Mama Luxe, please let me know if you do host a Drop In party! Thanks for visiting. Hey, I love the cow cookie! Argus, welcome! Glad you found us. I'm so proud of our cookies -- they always make people smile. I needed another sugar cookie recipe, thank you! The other batch came out weird (has cream cheese). It also helps that this one has such a great story with it!